The Panasonic EP-MA73 is the newest edition to the best selling Real Pro Ultra line. It features many of the same great features as the popular EP-MA70, but with the addition of 3D Ultra Kneading w/ Heated Massage Technology, Double Heating in the Rollers and the Soles, Ultra Air Kneading Technology, and a New Neck Line Stretch. The Panasonic EP-MA73 is the newest edition to the best selling Real Pro Ultra line. It features many of the same great features as the popular EP-MA70, but with the addition of 3D Ultra Kneading w/ Heated Massage Technology, Double Heating in the Rollers and the Soles, Ultra Air Kneading Technology, and a New Neck Line Stretch. The all new Panasonic EP-MA73 is truly like having your own personal masseuse in your home. The EP-MA73 is designed with one of the most humanistic massage rollers on the market today. The proprietary technology uses four massage heads (Quad Rollers) that open and close just like a human hand, as well as a 3D mechanism to scan and massage every contour of your back. Combine this technology with heat therapy, and you have one of the most humanistic massage rollers ever. The EP-MA73 Real Pro Ultra uses advanced pressure sensor technology to create a virtual map of your back. The EP-MA73 scans your body and then delivers a massage that is contoured to the actual curve of your spine. The massage heads then glide up and down your back, Appling a consistent pressure along your entire spine. The human body has approximately 350 acupoints in your body, with nearly 100 in your back and neck. From the soothing palm style of swedish massage, to deep tissue kneading, to Shiatsu massage, the Real Pro EP-MA73 has a variety of technologies to target acupoints, resulting in invigorating energy. The Panasonic EP-MA73 has all new heated massage rollers. The heated rollers simulate the warm hands of a professional masseuse combined with the soothing, restorative, sensation of hot stone therapy, loosening tense sore muscles, relieving tension and stimulating blood flow. This is some of the most advanced roller technology that we have ever seen, and is only on select Panasonic massage chairs. The Panasonic EP-MA73 has three new unique stretch programs. These use both air compression and massage roller technology to deliver a unique stretch to your shoulder blades, pelvis, and legs. Check out the 3 stretch features below. The airbags inflate and hold both sides of your shoulders in place as the heated 3D rollers gently push and stretch your shoulder blades and chest. Strategically placed airbags in the calf, foot and leg, hold and squeeze while the entire unit gently moves to stretch the lower body. This gentle traction provides yet another level of therapy while the massage chair also continues to work the entire upper body. The airbags inflate on both sides, and hold the pelvic region in place as the massage rollers massage your lower back. The airbags in the back and seat apply a nice compression to your hips, thighs and hamstrings. For the pelvic tilt, the seat airbags inflate alternately left to right for a swivel movement to the pelvis, which applies a nice passive movement, which is great for alleviating lower back pain. A Panasonic exclusive feature, the Junetsu massage technique quickly loosens up tight muscles and the spiral circular motion reverberates through your muscles to invigorate down to your bones surface. The EP-MA73 has the latest thumb-like rollers that move in precise, agile circles, relieving the core of your stiffness. Dual Purpose Recline - Blends in with your Living Room! The EP-MA73 is a dual purpose recliner. When not in use, it doubles as a sleek and stylish, comfortable arm chair. Just put on the ultra-soft head piece, fold the armrests down, and rotate the ottoman to make the foot massager disappear seamlessly as it rotates 180. This is great for anyone looking for a high quality massage chair to blend in with their living room seating. 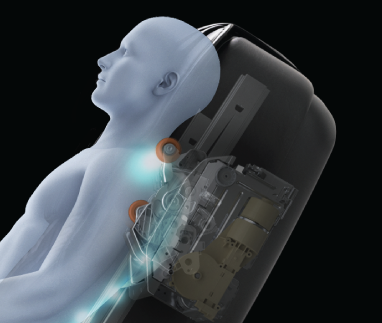 The Panasonic EP-MA73 has a 33 airbag compression system, to apply a full body massage to your entire your body. With airbags specifically designed and placed in the shoulders, hand & arms, hips, thighs, buttocks, and your calves and feet, you are sure to feel rejuvenated after each massage session. The EP-M73 has armrests that pop-up with airbags that are placed above and below the arm. These inflate applying a compression massage that helps relax your arm and hands. The armrest adjusts as you recline, this allows your arms to get a massage even lying down. There are airbags located on each side of the hips, as well as airbags in the seat that go around your waist. These inflate to massage your hips and your thighs relaxing your core and lower back. Various airbags inflate around the calves applying an air kneading massage that arouns the sides and back of your calves. This helps increase circulation and revuvinates tired legs. The EP-MA73 uses 3D air cushions that surround the feet appling a realastic foot massage, and is great for taking away all those aches and pains. Accupuncture nodes can be inserted or removed for a stronger or lighter massage. Panasonic is a leader in innovation and their all new 3D mechanism takes your massage to the next level. With next generation technology the rollers are able to travel up/down,left to right, as well foward and back. This allows for various 3D massage techniques making the massage experience more realistic. The 3D mechanism is able to perform 6 manual massage techniques: Gentle Kneading, Ultra Kneading, Shiatsu, Rolling, and Tapping. The Panasonic MA73 has 6 Pre-Set Programs in additon to the manuals programs. The Pre-Programmed massages use all of the various massage techniques and delviers one of the nost hunmanistic massages on the market. You can choose from: Refresh, Deep, Shiatsu, Hip, Neck/Shoulder, and Lower Back. If you would like to customize yout massage even further you can creat you own massages from the manual setting and save them even too! Massage to light or too intense? The Panasonic EP-MA73 has multiple ways to customize your massage. 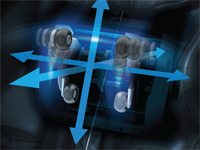 The airbag compression has 5 levels of intensity, and the massage rollers have 5 levels of intensity with its 3D mechanism. These are easily adjusted just by simply pressing the button on your remote. The EP-MA73 has upgraded armrests that are able to adjust when the chair reclines. This allows for a more thorough arm massage when in a deeper recline. With a push of a button the chair can recline to a full 173 degrees to a lying down position. This allows you to choose the posiiton in which you are most comfortable while receiving your massage. Panasonic covers their EP-MA73 Massage Chair with A 5 Year Limited Warranty. This covers Parts and Labor for 3 Years and Parts* for 5 Years from the date of purchase. This includes on-site service, on-site repair, or removal of the product to a Panasonic Authorized Service Center for 3 Years. *Parts replacement for 5 Years. Big Box: Includes the base of the chair, armrests, remote and remote stand, assembly hardware, cushions, manual, warranty, and introductory DVD. Box Dimensions: 28.7" × 30.7" × 63"